Marquez leaves MotoGP paddock with a sense of deja vu. MotoGP rookie and general prodigy, Marc Marquez continued his fine form that he has consistently displayed since first throwing his leg over the Repsol Honda, back in November. On the second day of testing at Sepang, the 19 year old improved on his best time of day 1, by just under 0.4 of a second, with a time of 2.00.803, set on lap 20 of 34. However, the gap to his compatriots Lorenzo and equally pint sized team-mate, Dani Pedrosa increased ever so slightly as well. Dani sits with a time 0.254 of a second quicker than Marc, going into day 3 of the test. Number 93 was putting more consistent laps in before the end, whilst beginning to test the electronics on his RC213V. Once again, the pocket rocket was just in front of Rossi, who himself lapped half a second faster than on day one. “I am happy, because we improved our pace a lot and that is what our focus was for today. The final stints on track were more onsistent, which helped us to obtain better data. Today I started to work a little with the electronics and we have a few ideas to put into practice tomorrow and in future tests. This is making me learn new things and I am little-by-little understanding the way the electronics behave on this bike.” Said Marquez. 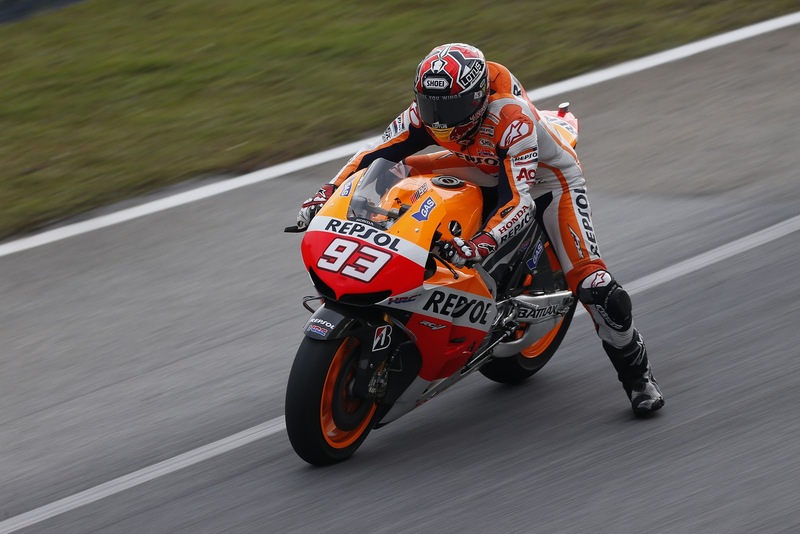 Fellow Repsol Honda pilot, cap’n Pedrosa was on top again today, beating his time from day one by 0.354 of a second. He also increased his lead (negligibly) over reigning world champion, Jorge Lorenzo to 0.019. He was due to test the new hard compound tyres in the afternoon, however heavy rain which fell after lunch washed out that plan. He will test the new tyres tomorrow, weather permitting. “Today I was able to try some more things on the bike and we made a few positive steps forward from yesterday. The feeling is good, I’m happy and that’s what’s important. We had planned to try a few more things in the afternoon, like the hard compound tyres, but it started to rain early and we were unable to go out. We hope that it is good weather tomorrow so that we can try them out, as in the coming season it will be important to ride fast on that compound. We also hope to continue moving forward with our quest for the best bike setup.” Said Pedrosa. All of today’s lap times can be found here. Previous Previous post: Alstare: "The end of a great story"
Next Next post: Sepang day 3, final round up: Pedrosa fastest, Espargaró pesters Ducati, Rossi in 3rd.